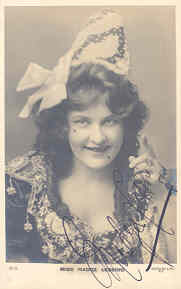 The actress Madge Lessing was able to celebrated many successes as a stage actress at the end of the 19th century. Her film career, which she began in 1913, concentrated exclusivey in Germany. Her first movie was "Wo ist Coletti?" (13), it followed the movie "Die blaue Maus" (13). She appeared only in few more movies in the next years, among them "Die Welt ohne Männer" (13), "Die blaue Maus, 2. Teil" (15) and "Fritzis toller Einfall" (16). The director of all her movies was always the outstanding Max Mack. When Madge Lessing went to England she concentrated to the theater again. Madge Lessing was married with the stage manager George B. McLellan.